Police closed the B9006 between Ardersier and Fort George on Friday afternoon. The Royal Navy's bomb squad was called to the Highlands following the discovery of what was believed to be a piece of unexploded ordnance. However, the old expired device was found to be empty and was quickly removed to be destroyed. 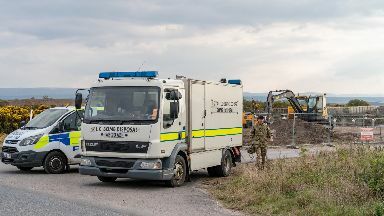 Police closed the B9006 between Ardersier and Fort George, an army barracks and former artillery fortification, after the "old war unit" was found on the nearby shoreline of the Moray Firth on Friday afternoon. A Police Scotland spokesman told STV News that the Royal Navy confirmed the historic device was empty and removed it from the scene shortly after 5.38pm.